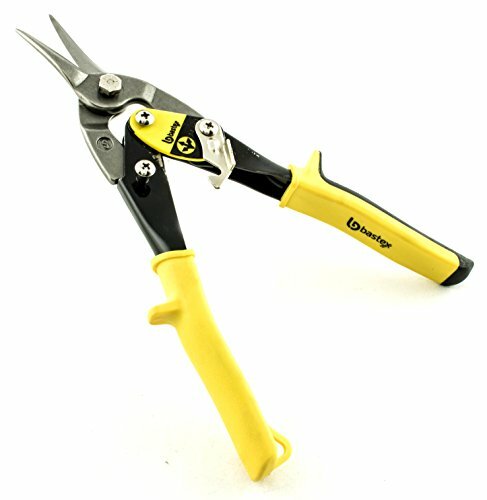 GENERAL USAGE: These aviation tin snips are built to cut through thin sheets of metal and aluminum tin. Allows for a great amount of force with the compound design. Cuts through many types of metal very smoothly. PRODUCT FEATURES: These compound snips provides two pivot points that help reduce the amount of pressure that is needed to cut. A hook feature is included to help keep snips closed. Great for cutting thin metal, 18 gauge wire, metal screens, can also be used in some arts and crafts when you need to cut with additional leverage. COMPOSITION: Head is made of hardened steel and the handle base is made of durable rubber. Should be able to last through any snipping job you can throw at it. Stores well in any toolbox or drawer.